Prominent & Leading Exporter from Jalandhar, we offer scaffolding clamp, pressed swivel clamp and pressed fittings. 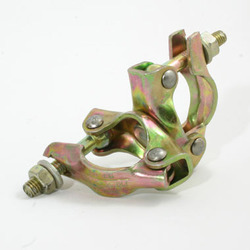 We have gained specialization in manufacturing best in class Scaffolding Clamp. This is the most fundamental tool used in fastening tubes and pipes together. Widely demanded in civil construction and fabrication projects, the offered clamps are availed in forged and pressed steel fabrication in fixed and swivel designs. Our prestigious clients can order these high performing clamps in bulk quantities from us at an equitable price range. We have been able to offer our clients a qualitative range of Pressed Swivel Clamp.